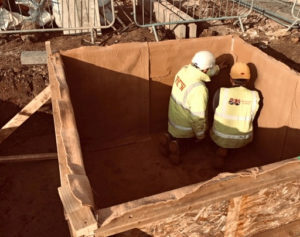 Triton Systems approved contractor, British Damp Proofing of Alford, Lincs, installed products supplied by Triton Systems, to waterproof two lift shafts in a development of 25 dwellings. 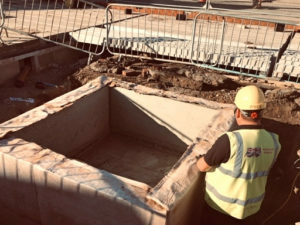 Pic 1 shows the installation of Triton’s Bentofix BFG 5000 membrane to waterproof the lift slab base and kicker, which were poured using concrete made waterproof with Triton TT Admix. Triton’s Adcor 510S waterbar was then installed on to the kicker. The lift shaft walls were poured with Triton TT Admix concrete and, on removal of the shutters, Platon Double Drain membrane was installed externally to protect the Bentofix membrane (pic 2).